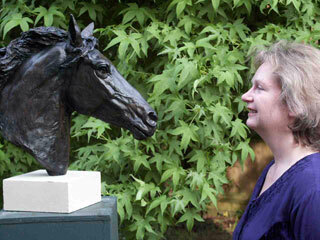 Kate has a new range of equestrian sculptures. Full figure horse sculptures and detailed head studies form the basis of this collection. All these pieces are produced as limited editions and are designed to explore the vivacity, power and movement of horses. Kate works in clay, wax or Plastilene, from which the finished pieces are cast in bronze or Jesmonite. Trained at Bath Academy of Art and Medway College of Design, Kate spent 10 years sculpting for the film industry. Since the birth of her daughter, she has worked as a freelance sculptor and is now concentrating on her own work. She lives in Kent UK with her husband, her dog, her cats and a studio full of projects. The creation of each horse sculpture comes from the detailed study of the subject and the passion to explore the subject’s possibilities. Each sculpture is born from the desire to communicate the reality of the horse’s physique. Each sculpture evolves from the study and exploration of the horse’s anatomy. Each sculpture is built on the need to express the horse’s power and beauty. Study is the basis of each sculpture, discovering the elements that will combine to create an expression of the living being. Each idea is noted in sketches and maquettes until the final realisation is begun and a new sculpture begins to spring to life. Detailed knowledge of the bone structure and musculature of the horse is used to build the form; and knowledge of the horse’s anatomy, allows the form to be shaped, and the spirit of the animal to be shown in the finished sculpture. In her work she seeks to express movement and expression – life and vigour. The theme of her work is to explore “that we are more than we think we are”. Overall the goals of her sculpture can be seen as life affirming and optimistic.